Here’s your new interview with one of the winners from the 9th Adonis Golden Ratio Transformation Contest. 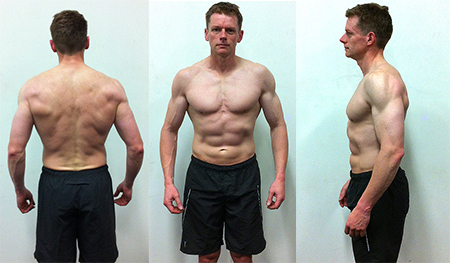 Today John talks to Pete Dickison who placed 1st in our last 12-Week Transformation contest. 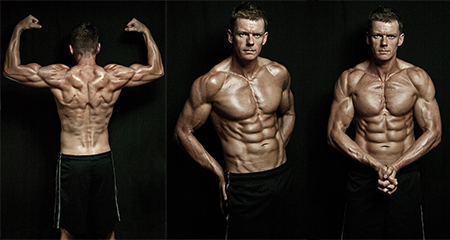 Pete, is no stranger to the Adonis Golden Ratio Systems and has followed the Adonis Transformation contests three times now (AT7, AT8, & AT9), each time starting in better shape and finishing in even greater shape than his last run through. 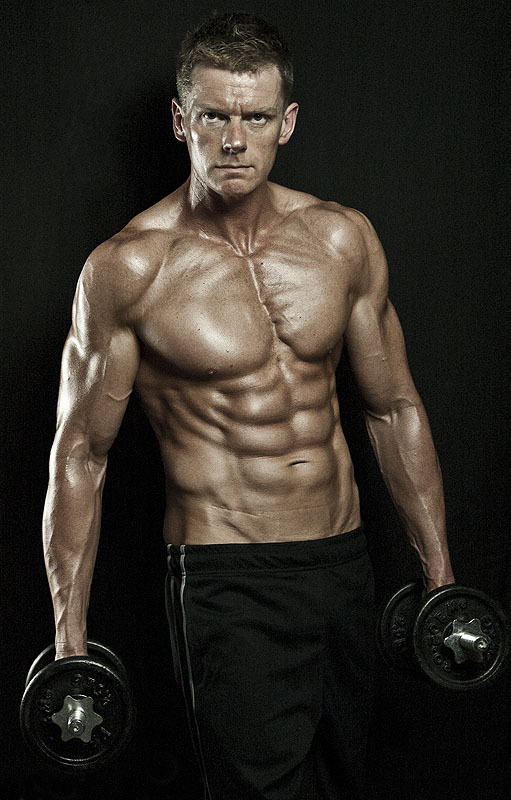 Read on to find out how he built a “Three-Pete” physique. How old are you? I am 42 years old. When did you first start working out? If it was before finding Adonis can you briefly explain the types of programs/workouts you did before finding Adonis? I started weight-training properly somewhere around 28 or 29 years old. Prior to that, I had tried it for a few months in my late teens, but wasn’t really interested. I was an academically focused kid at school and the only sports I was really into were cross-country running and fencing. It was in both of these sports that I represented my high school and competed at a regional level. I did a lot of functional fitness training during my stint in the Army, but only got into regular weight training in my late twenties, as I wanted to build myself up for selection into a U.S. Special Forces unit. Up until then I was pretty skinny. It was all functional training, and resistance training with weights being only a small part of it – perhaps 2-3 sessions a week, along with bodyweight circuits, lots of running up hills, HIIT-style sprint sessions, swimming, load-carrying, climbing, etc. Despite the focus not being on weights, the weight training component was actually quite advanced, with supersets, periodization, pyramids, body-part splits and so on. I was often times recording the weight I used and tracking my progression. I trained like this, twice a day during the week and a couple of times on weekends, for maybe eight years. I got very very fit, built some mass, and discovered I had pretty good endurance. Unfortunately, I sustained some severe injuries from a military parachuting accident. After recovering, I never returned to my original training routine as I now had to tend to a crippled left ankle, bad neck, back, knee, etc. When I left the Army in the late 2000’s, I did no weight training for almost four years– only some token pushups / situps a few times a week. I put on about 40 lb over several years after leaving the military: eating like I was still training twice-a-day, without the actual training! I joined a civilian gym in late 2010, and just ‘worked out.’ Mostly on machines or cardio equipment. I was still trying to train for ‘functional fitness’ (whatever that means), despite having no job requiring a level of physical fitness, nor playing any sport requiring same. However, during 2011 I got into Crossfit-style training. I spent about six months doing this, along with quite a few Bootcamp-style outdoor courses for the rest of the year. I trained five days a week and worked really hard. The cruel irony was, deep down inside all I really wanted was to improve my physique, and at the end of a year-and-a-half of hard work, I was still forty pounds overweight and looked like crap. Then I discovered the Adonis Golden Ratio, and it all changed. Did you follow any sort of diet programs before finding Adonis Golden Ratio? If so what were they and how did they work for you? I briefly tried the ‘Zero Willpower Eating System’ from the Sixpack Shortcuts site. I found it impractical, after trying it for several weeks, to constantly lug around tupperware containers of chicken and rice, and eat so many times a day. I did learn a few good things from the system: the beauty of a Foreman Grill; the cooking ‘how to’ videos were good; and they really got me into the concept of liquid calories affecting you as much as calories from food (at which point I cut the litre of juice and large chocolate milk I was drinking each day). I lost a bit of weight, but I thought there had to be a better way, as I couldn’t see myself eating out of tupperware for the rest of my life. How did you find the Adonis Golden Ratio? Like Renne Ramirez, interviewed previously, I found the Adonis Golden Ratio (AGR) through the same Dan Rose interview with Brad Howard. I was intrigued by the ‘Golden Ratio’ idea, and looked into the AGR site. I was hooked right away by what I found, and bought the Anything Goes Diet (AGD) diet first. Here was a guy (John Barban) telling me I could eat whatever I liked, and still get a sixpack and ripped, just by doing something as simple as counting calories and creating a caloric deficit off my Resting Metabolic Rate (RMR). No special meals, or restricted foods, or eating seven times a day. I knew understanding diet was my biggest issue; I didn’t even know what a calorie was back then! Reading further, I was so impressed by the science and logic, and the simplicity of the philosophy, that I bought Eat Stop Eat and the Adonis Index 3.0 workouts. It all just worked. I was too late to enter Adonis Transformation Contest 7 (AT7) (Jan-April 2012), so I just shadowed that contest, got phenomenal results, and just kept on going with the AGR lifestyle. What made you decide to enter the contest? 1) The first was to give me some incentive and timeframe to take my physique to the next level, from where I had been at the end of AT7. 2) The second was because, in the months since AT7, I had been experimenting a bit with my diet, playing around with macronutrient ratios, meal timings, trying new types of foods, and (importantly) figuring out maintenance calories. I was also focussing a lot on building muscle during this time. As a result the pendulum had swung back a bit in regards to my body fat %, and I wasn’t looking as good as I did at the end of AT7, despite having put on some muscle. I had registered for Adonis Tranformation Contest (AT8), but never submitted final pics, as it wasn’t until the last month of AT8 that I finally got maintenance and dieting ‘nailed’ and under control. Too late to get a measurable result, or look good enough (I felt) for a photo shoot. AT9 was a chance to reset, and refocus after my inconsistent efforts over AT8. 3) Lastly, the new Adonis Index Gauntlet (AIG) workout was released at the time the contest started. I wanted to use the contest as a means of road-testing the AIG, along with my (finally figured-out) dieting regimen. What did you expect from yourself during this contest? I had no real expectations beyond ending in better shape than I began. I wasn’t so much ‘in it to win it’, as I was in simply using the contest as incentive to push harder in training and stick to my diet. I knew the final result would mostly be a question of nutrition, as I had built up a bit of muscle during the year and was happy with my proportions generally. How did you fit the workouts into your daily routine? I always trained first thing in the morning, to get it out of the way so I could get on with the rest of the day. I did make training a big priority during the contest, and put it above almost everything else in my life. I would start a week saying to myself something like, “I will train six times this week” and just make it happen no matter what! My time was flexible and I had few commitments, so I often spent up to three hours training, five to six days a week. What did you do from a diet standpoint? I counted calories religiously (in MyFitnessPal); weighed portions of my food at home on a scale; used the calorie numbers off the Reverse Taper Diet (RTD) as a guide; made sure I had sufficient protein intake (for me this meant somewhere in the 150-200g range per day). I ate as little refined-sugar as possible. I did NOT worry at all about meal timings, numbers of meals in a day, post-workout nutrition, pre-workout supplementation, and all the other dogma. My focus was mainly on calories and sufficient protein intake. These two things were the most important. After that, I concentrated on eating lots of whole (less processed) foods, whole grains, low (or natural) sugar foods – I suppose what you might call ‘clean’ eating. I just seemed to get a lot fuller for the same calories, as most of these foods were filling but not calorically dense. I sometimes rated foods by how many calories per gram they had. Lower was better. I still had (occasional): cake, chocolate, treats (like ice cream or a donut), along with my daily Subway 6″, and the odd restaurant meal. If I ate out I made sure I opted for low-calorie options or ate small portions. I don’t drink alcohol, so I saved a lot of calories there. I’d drink diet soda if i went out somewhere. Some days I ate six or seven times, most days only three meals: moderate breakfast (just before training), small lunch, and a big dinner. A few days I only ate two (large) meals – one in the morning and one at night. Most days I ate just below or at maintenance calories, with only maybe a couple of weeks in any really substantial caloric deficit, then maybe only 500/day deficit. My aim was to eat as much as I possibly could each week, while still dropping body fat. The Reverse Taper Diet calculator was a great help here. I went off the exact number it gave me, as my average to shoot for. This meant I had plenty of energy for training, and adequate calories for building muscle while gradually leaning out. I ate normally right up until the day before my photo shoot, then just reduced water the evening prior, had an early (light) dinner, and then didn’t eat or drink much on the day of the shoot – a few sips of water and a couple of snacks until the shoot was over. No ‘peak week’ or carb-loading, or carb/fat-loading or cutting carbs. I looked good the week before the shoot so just repeated that weeks eating pattern again. What did you find most challenging along the way and did you have any setbacks? Diet compliance was the biggest challenge. It always is with me, as I love my food – and lots of it! With the volume of training I was doing (AIG + boosters, usually 6 days a week) I built my appetite up at times. There also seemed to be a never-ending round of children’s birthday parties to attend, and cake and lollies are my hot-button foods, so I had a few weekends that undid some otherwise good weeks of dieting, bringing me back up to maintenance calories. How did people in your life react as your body started to change? I had gone through most of the (positive and negative) reactions from other people during my initial transformation back when I started AGR. Most people close to me were used to me having lost a lot of weight already. Most of the comments I got over AT7 were positive, and related to how muscular I had gotten. I seemed to keep bumping into people I hadn’t seen in the gym in months, and they all commented positively. After the contest I went to the swimming pool a few times, and it seemed like everyone was staring; I seemed to be the most ‘in shape’ guy anywhere i went. It was a good feeling. When did you realize things were really starting to change? Probably around the end of the second month of AT9, I felt I had gotten back to my AT7 form, and from then on in that last four weeks, I saw noticeable improvements each week. However, it wasn’t until the morning of my photo shoot, when I was all water-depleted and getting a spray tan, that I looked in the big mirror they had up there, and then I really noticed a big difference. How did you feel when you looked at your before and after pictures side by side? I feel embarrassed that I let myself get into the ‘before’ picture shape, especially after being in great shape before. I just kept remembering something John Barban said, that sometimes it can take a few run throughs of a contest-type situation, each time starting in better shape and finishing in even better shape than the last run through, until you finally achieve the body you want. What advice would you give to other guys who are sitting on the fence not sure about entering a contest? If the timing is right, i.e. you are starting out with the Adonis Golden Ratio system at the same time a contest is about to start, then go for it. You have nothing to lose and everything to gain. No one even has to know you’ve entered, if you don’t want to tell them. If entering is too much, just shadow the contest like I did with AT7. If it’s a while until a contest starts and you desperately want to make a transformation, then don’t wait for a contest – start immediately! The contests are a terrific way to motivate you, and I believe they make a real difference to your results compared with not being entered, but as the best thing you win in a contest is your new physique, then you need to start working on that right away, not ‘tomorrow’ or ‘some day’ – NOW! I’ll be following the AGR lifestyle this year, and probably the rest of my life, continuing to make minor improvements in my physique. I think that once training becomes such an integral part of your lifestyle that, to your friends, it’s just ‘what you do’, and once you get the concept that the physique you see in the the mirror is a direct result of what (and mainly HOW MUCH) you eat each day, I don’t think you can ever go back to your old ways of training and eating. I certainly can’t. It can take a few run throughs of a contest-type situation, each time try to start in better shape than the last run through, until you finally achieve the body you want. If you want to get in touch with Pete, talk to him about his approach and get more tips, here’s his profile in our community.